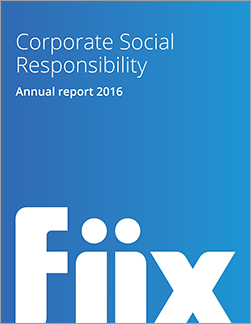 Toronto, Canada—April 27, 2017—Fiix announced today the release of its corporate social responsibility (CSR) annual report, which cements social responsibility as an inextricable part of the company’s business model. Fiix—the industry leading provider of cloud-based maintenance and asset management software—takes a triple bottom line approach to formally measuring the success of its CSR initiatives. Under this approach, it commits resources to people, profit, and planet, and marries each element to the themes of inclusivity, responsibility, and sustainability. The report refines these categories with specific commitments informed by the UN Sustainable Development Goals, in order to sync its priorities with those of the international community. These commitments include promoting inclusivity and accessibility in the technology industry, being profitable in a responsible and ethical way, and supporting initiatives for climate change mitigation. “We’ve built a resilient CSR policy that is much more than just a moral compass. We’re committed to giving 1% of our time, resources, and revenue to the CSR initiatives that make up our triple bottom line, which means our commitments will grow with us,” says Katie Allen, Corporate Social Responsibility Manager at Fiix. The ideas of people, profit, and planet have been key pillars for Fiix from the start, and instrumental during the company’s significant growth in 2016. The past year was devoted to building a talented and diverse team, and Fiix’s people-first work environment helped attract and retain some top talent in Toronto’s vibrant and competitive technology industry. “CSR is at the core of everything we do. It lets us foster an open and inclusive workplace, which contributes to the success of the business,” says Marc Castel, CEO of Fiix. “Even our software itself helps build more efficient facilities. By improving how our customers maintain their assets we can directly affect the impact of industrialization on the environment. And by making CSR an essential part of how we do business we’re setting an example of what a truly responsible company looks like,” says Castel.